We prefer to use museum mount board which is cotton or linen based and less prone to acid hydrolysis (Cellulose is destroyed by this process from lignin and alum reacting together). Conservation mount board is wood based but ‘buffered’ with chalk to neutralise these assets; we can supply this if requested. All types of mounts are offered; window, recess, float, wash lines etc. 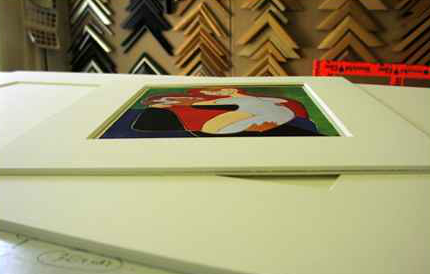 We cold-mount to a variety of substrates, including aluminium and foam-core.